Click on the image to see the promotional poster. 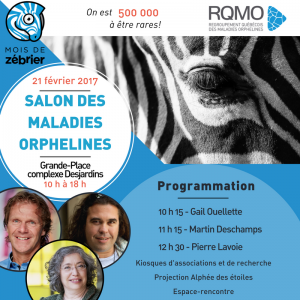 The Orphan Disease Expo will take place at the Grande place of the Complexe Desjardins on February 21st from 10 a.m. to 6 p.m.
Several exhibitors from rare diseases associations as well as the research sector will allow the public to raise awareness and learn about rare diseases. Pierre Lavoie, the leader speaker from the Grand défi Pierre Lavoie, and the singer-songwriter Martin Deschamps will also be there. To consult the Complexe Desjardins website, click here.